5% Off Everything - Simply apply the Voucher Code below at the Checkout! Don't miss out on our offer!!! Simply enter the Voucher Code "BlackFri18" at the Checkout, when you have finished shopping. Celebrate Black Friday until Cyber Monday this year by taking advantage of our 5% discount offer. Do you shop online...never want to miss a delivery again? You need to buy a secure parcel box, we have many different designs available. Purchase in time to receive your Christmas packages this year! Or perhaps your property requires a railing and gate letterbox, or an exclusive designer letterbox, to complete your home in style. Whether you're looking for a modern letterbox, or a traditional letterbox, we can help with our wide range, all on offer. In addition to individual letterboxes, we supply and install multiple letterbox banks in a variety of models, to work in harmony with the architecture and interior design of any building. Or if you're looking to be bold, try one of our "show your colours" range, a personalised letterbox either choose from our unique range or provide your own image/logo. 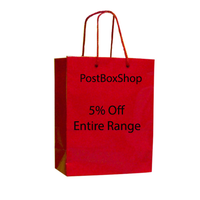 Help us celebrate this year at Postbox Shop and take advantage whilst stocks last.